This post is part of our blog series on art therapy by our Art Center Director, Ally Root. Ally is passionate about the ways in which the creative arts can bring healing, and she will be sharing her thoughts here along with projects that she has completed with the children at our Care Center in Ghana. You can read her previous posts here and here. “Found object originates from the French objet trouvé, describing art created from undisguised, but often modified, objects or products that are not normally considered art, often because they already have a non-art function.” (Museum of Modern Art Collection, www.moma.org). Using everyday items, or “found objects,” in art can be a very meaningful experience. Found objects can include anything from old household items to discarded trash. By using found objects as an artistic way, the artist has the opportunity to take something seemingly mundane and turn it into a unique aesthetic entity. Found object creations are very valuable in art therapy because they allow the participant to attach their own unique meaning to items that may commonly hold a completely different significance to others. Making “found object art” can also metaphorically describe a transformation process by turning something from “trash to treasure”. Found object art has been likened by famous artists in the past including Marcel Duchamp and Pablo Picasso. Duchamp is credited with being one of the first well-known artists to utilize this method. One of his works includes an old bicycle and a stool. 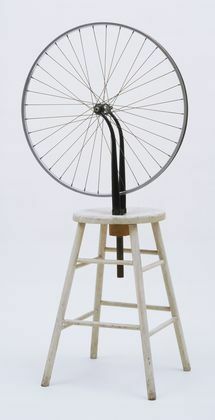 Duchamp challenges the meaning traditionally attached to these items by turning them into an abstract sculpture. Another artist who particularly favored the use of found objects in his work was Haim Steinbach. Steinbach used everyday consumer products to create modern art sculptures. Steinbach gained immense popularity for his work, and is considered a prominent contemporary artist. Some of his sculptures include dog toys and used household items. The first week I was at the Touch A Life Care Center this past January 2014, the children were given a homework assignment in school to create a sculpture out of old tin cans. I saw the kids make some very impressive artwork. They used knives to cut open the discarded tin cans and then smoothed and molded the material with stones to create whatever image they chose for themselves. 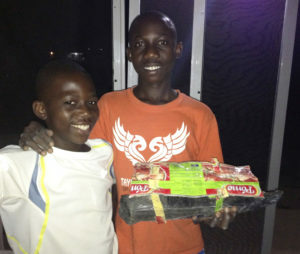 One child in particular stood out by making a fishing boat out of old tomato sauce cans. Gameli O. took the assignment very seriously. I watched him carefully and meticulously cut, mold and hammer a seemingly useless object (the old can) into a beautiful fishing boat! He was so proud of his work that after hours of working on it, he came to show me the finished product. Not only did Gameli have the chance to show off his talent for working with all sorts of materials, but he also allowed the viewer of his art a small glimpse into his past of living on Lake Volta. I was very impressed with Gameli’s talent and creativity, as well as his pride in his work.